Three men were involved in the invention and development of the first powered airplane-that's right three. Everyone knows about the Wright brothers, but that third man was Charles E. "Charlie" Taylor, a quiet genius who loved cigars and the sound of machinery. Although he contributed to one of man's greatest achievements, "Powered Flight," his name was almost lost in aviation history--until now--and if it hadn't been for Charlie that first powered airplane would never have gotten off the ground. Charlie Taylor was born on a little farm in Cerro Gordo, IL, on May 24, 1868. As a boy Charlie moved to Lincoln, NE, with his family. Charlie quit school at the age of 12 and went to work as an errand boy for the Nebraska State Journal. However, Charlie was mechanically inclined so later, when he began working with machinery in the Journal's bindery, it came easy for him. When Charlie was in his twenties he moved to Kearney, NE, where he went into a business of making metal house numbers. While in Kearney, Charlie met a young lady named Herietia Webbert in 1892 and married her two years later. In 1896 the Taylors moved to Dayton, OH, where Charlie worked for a Stoddard Manufacture which made farm equipment and later bicycles. It was in Dayton where Charlie met the Wrights. Mrs. Taylor's uncle rented the building on West Third Street to the Wright brothers for their bicycle business. This was a convenient connection, because, in 1898 when Charlie started his own machine shop, Orville and Wilbur Wright brought him special jobs, including a bicycle coaster brake they had invented but later dropped. Charlie eventually sold his tool shop for a profit and went to work for the Dayton Electric Co. However, he didn't like his job so he accepted, when the Wright brothers asked him to work for them at $18.00 per week. This was a good decision for several reasons: The Wright brothers' shop was only six blocks from where Charlie lived, he could ride a bike home for lunch every day, he was making eight dollars a week more, and he liked the Wright brothers a lot. Charlie started to work for the Wright brothers on June 15, 1901, doing routine repairs on bicycles. This let the Wright brothers pursue their experiments with gliders which included many trips to Kitty Hawk. After one of these trips, the brothers decided they needed more accurate information then was available and decided to build a small wind tunnel with delicate force balance. With this, they would measure the amount and direction of air pressures on plane and curved surfaces operating at various angles and improve their theories based on their gliding experiences. Building the wind tunnel was the first job that Charlie Taylor did for the Wright brothers that had any connection with aeronautics. The wind tunnel was a rectangular box with a fan at one end driven by a natural gas engine. Charlie ground hacksaw blades and used them for balance in the tunnel. The Wright brothers did many experiments in their wind tunnel and from this data they began to make their 1902 glider with Charlie machining many of the parts. On August 13, 1902, the brothers shipped the glider to Kitty Hawk. They did several flights with the glider and on October 31, 1902, the Wrights returned to Dayton to make plans for a powered airplane. Through their experiments, the Wrights were able to accurately predict the horsepower--eight--which was needed to produce and achieve powered flight. The next problem was where to get a light engine that would produce eight horsepower. The Wrights knew that a steam engine might suit their purpose, but a gasoline engine would be safer and more efficient. On December 3, 1902, the Wrights sent letters to almost a dozen automobile companies and gasoline engine manufacturers asking if they could produce or modify an engine that would develop eight to nine brake horsepower, weigh no more than 180 pounds, and be free from vibration. Most companies replied that they were too busy to undertake building such a special engine. Falling back on their own mechanical experience, the Wright brothers decided to design and build their own engine. They estimated they could build a four cylinders engine with four inch stroke and four inch bore, weighing no more than 200 pounds with accessories included. By their calculation, it would develop the horsepower necessary to power the glider in flight. Now the problem was who was going to build the engine, but it was easily solved. The brothers decided that they would give the task to Charlie and they would build the airframe. Charlie was excited about this new challenge. From his knowledge of mechanics and design he knew that the engine design was basic, straight forward, simple, and capable of being successful. Charlie had very limited knowledge about gasoline engines, but he used his craftsmanship, genius, enthusiasm, and efficiency to tackle the task. Charlie started building the engine in the winter of 1902-03. Without any formal drawings available, it was necessary for each part to be crudely sketched out by the Wrights or Charlie on a piece of paper. After a thorough discussion about it, Taylor would pin the drawing above his workbench and go to work to complete it. Using these sketches and specifications, he finished the engine in six weeks--an amazing accomplishment. I want to describe in some detail of how Charles Taylor made the engine so you can appreciate the craftsman he was. The first problem that Charlie and the Wrights faced was the crankcase. The case had to be light and strong. Aluminum was still a rare metal in those days and it was difficult to get a good sound casting. John Hoban, foreman of Buckeye Iron and Brass Foundry in Dayton, took on the job of making the crankcase using the strongest aluminum he had. The cylinders were turned from fine-grain gray cast iron and had a bore of four inches. The top and bottom of the cylinders were threaded so they could be threaded into the crankcase and a water jacket could be threaded on them. The next major task for Charlie was making the crankshaft. Being a mechanic most of my life, I would never even attempt taking on a project of making a crankshaft with the equipment that Charles Taylor had--a drill press, a lathe (both run by a natural gas engine), and hand tools. Charlie secured a plate of high carbon tool steel that measured 1-5/8 inches thick, six inches wide, and 31 inches long. On the plate he traced an outline of the crankshaft and carefully, painstakingly drilled hundreds of holes along the outline of the crankshaft. This weakened the plate enough so he could knock the excess material away with a hammer and metal chisel. Once this was done, he had the rough cut crankshaft ready for the lathe and the finish cut. With the small natural gas engine chugging away at full power driving the large wide leather belts that turned the lathe, Charlie turned out a near perfect crankshaft to the thousandth of an inch. The next part that Charlie worked on was a fly wheel from a solid block of cast iron. The connecting rods, intake valves, exhaust valves, pistons, valve guides, rocker arm, and numerous other parts that made up the complete engine were carefully thought out by Charlie and tailored to fit the operation of the engine. Charlie painstakingly assembled the engine part by part, fitting and refitting each piece with the meticulous care of a jeweler making a watch. He scrutinized every detail. He assembled and disassembled the parts, time and time again, making sure of their operation until all the parts were working in harmony. It took a lot of genius and ingenuity and the engine was finally complete and assembled in February 1903. It was mounted on a test stand and ran well, producing eight horsepower at 670 rpm and 11 hp. at 1000 rpm. Charles E. Taylor had successfully built the first aircraft engine. As a result of the engine producing 12 horsepower at full rpm, the Wright brothers were able to add another 150 pounds to the aircraft which allowed them to strengthen the wings and framework. The engine with its dull propeller drive drove two counter rotating pusher propellers by means of chains. The Wright brothers designed and tested propellers in the wind tunnel and built several propellers that would be used for the first successful flight. Charlie also made all of the metal parts such as all of the metal fittings where the wooden struts joined and spruce spars and Roebling truss wires were attached. On September 23, 1903, the Wright brothers left Dayton for Kitty Hawk to start preparation for man's first powered flight and the Flyer followed on September 25. The Flyer was assembled and the engine was installed on November 2. To reduce the danger of the engine ever falling on the pilot in case of a wreck, it was placed on the lower wing to the right of center. When the engine was started, the vibration from the irregular firing caused failure of the prop shaft extensions. Charlie made new shafts out of solid steel which held up during the first flights. On December 17, 1903, in the mid morning after a run of about 40 feet at a rate of approximately seven to eight mph, the first successful powered aircraft lifted off and flew 120 feet in 12 seconds thus introducing a new era of transportation. Although the first flight wasn't publicized that much, Charlie and the Wright brothers were very excited. The Wright brothers decided to build another flying machine, but decided against going again to Kitty Hawk. They looked near Dayton for a level place for flying. After a few days of searching the Wrights found a suitable ninety-acres pasture, often called "Huffman Prairie," belonged to Torrence Huffman, a Dayton bank president. He allowed them to use it free--provided they didn't run over his cows. Charlie and the Wrights built a hangar to house the airplane and moved into the new facility on April 20, 1904. Charlie took care of the field and facility while the Wrights were going around the country and world. He was the first airport manager. In a 1948 interview Charlie said that he had "always wanted to learn to fly, but I never did. The Wrights refused to teach me and tried to discourage the idea. They said they needed me in the shop and to service their machines, and if I learned to fly I'd be gadding about the country and maybe become an exhibition pilot, and then they'd never see me again." How prophetic those last words were! The Wrights were trying to sell the aircraft to the military and started to do demonstration flights on September 3, 1908. Orville flew and Charlie kept the aircraft in good flying condition. On September 17, Charlie was slated to fly with Orville, but before the flight, larger propellers were installed to compensate for the heavier weight of the two men. At the last minute Charlie was replaced by Lieutenant Thomas Selfridge, a 20 year old West Point graduate from San Francisco. During the flight Orville heard a strange noise. He looked around, but didn't see anything. However, he decided to shut the engine down and land. Suddenly, there were two large thumps and the aircraft shook violently, as Orville tried to control aircraft to the ground. About 20 feet from the ground the aircraft started to correct itself, but it was too late. The aircraft hit the ground, killing Lieutenant Selfridge and badly injuring Orville Wright. Lieutenant Thomas Selfridge became the first passenger casualty in a powered aircraft. After the accident, Charlie investigated the crash scene and found the new propellers that they put on before the flight had delaminated. Charlie reported his findings to Orville, who was in the hospital recovering from his injuries. Charles was the first person to investigate a powered fatal accident flight. Charles Taylor continued to work with the Wright brothers until 1911. At this time an adventurer and a pilot, Calbraith Perry Rodgers, wanted to make the first continental flight across the United States. He purchased an aircraft from the Wright brothers and enough parts to build two more aircraft. Orville realized that the aircraft would not last more than 1,000 miles without proper maintained, so he lent Charlie to Rodgers knowing that he would be the only one that could keep the plane flying for that distance successfully. Charlie sent his family ahead to California and got on the three car train that was to accompany the flight. One car of the train was a repair car where the aircraft parts would be stored and the aircraft repaired. It took Cal Rodgers 49 days to cross the United States. Three days, ten hours of that was actual flying time. His longest single flight was 133 miles. He had 16 crashes and the aircraft was repaired so many times that at journey's end only the vertical rudder, the engine drip pan, and a single strut of the original plane remained--a test to the skill which Charlie used in keeping the aircraft flying. This was the last of Charlie's big adventures. 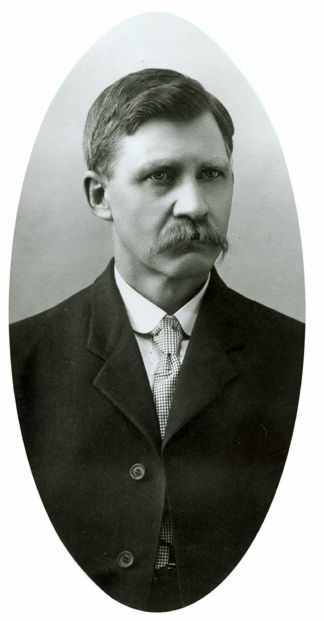 Charlie returned to Dayton and worked for the Wright-Martin Company until 1920. Charlie eventually moved to California and lost touch with Orville Wright, but things turned bad for Charlie. The Depression hit and Charlie's machine shop failed. He lost his life's savings in a real estate venture and his wife died. Charlie Taylor's contribution to aviation was forgotten until 1937 when Henry Ford was reconstructing the old Wright bicycle shop in Dearborn, MI. Detectives found Charlie working at North American Aviation in Los Angeles for 37&CENT an hour. None of his co-workers realized he had built the first aircraft engine. Charlie worked for Ford until 1941 when he returned to California and worked 60 hours a week in a defense factory. However, in 1945 Charlie suffered a heart attack and was never able to work again. In November 1955, a reporter discovered Charlie in Los Angles General Hospital's charity ward--he was almost destitute. His income was his Social Security and an $800 a year annuity fund belatedly established by Orville Wright before his death in 1948. The aviation industry immediately started a campaign to raise funds for Charlie. He was moved to a private sanitarium where he died a few months later on January 30, 1956, at the age of 88. Having no close relatives, Charles E. Taylor was buried in the Portal of Folded Wings Mausoleum dedicated to aviation pioneers, located in Valhalla Memorial Park, Los Angeles. Charles E. Taylor was the last of the three that shrunk the world by building the first successful powered airplane--the mechanic who made the flight possible.